When I started running, I had no idea what half of the stuff I know today, even existed! I would follow the runs on the couch to 5k app, complete them each week and that was that. As I started to get into running more, and then training for my first half marathon, I started to become aware of all I know now. From Fartlek runs to energy gels and everything in between, a whole new world started to emerge and my adventure began! There was one very popular piece of running apparel I noticed a lot of my running followers wearing, and those were these long, colorful and fun looking socks. I was eager to find out more about these socks and read a few articles as well as messaged a few friends. After much speculation and finally, being recommended I get a pair, I bit the bullet and ordered some. Since then, I’ve definitely noticed the positive affects from compression and how much they really help my legs. The aim of the socks is to compress the legs, allow the blood to keep circulating and decreasing soreness. I don’t wear them during or after every run, but when I do wear them, I notice such a difference! I discovered Rymora Sports, through recommendations, and decided to order a pair, from Amazon. They arrived promptly and I couldn’t wait to get out and try them. I enjoy variety and color co-ordinating my outfits – yes, sad I know…! – and I was excited to have another pair to add to my collection. I mean, you can never have too much running gear either, can you?!! I was instantly impressed, before I even put them on. They are thick, so I’m thinking great for winter runs; comfy, super soft, have an eye catching design and are tight! Admittedly they are a little long and go above my knee, but that’s not a huge issue. After a small trial run this afternoon, I can confirm they are another firm favorite of mine and look forward to wearing them again! 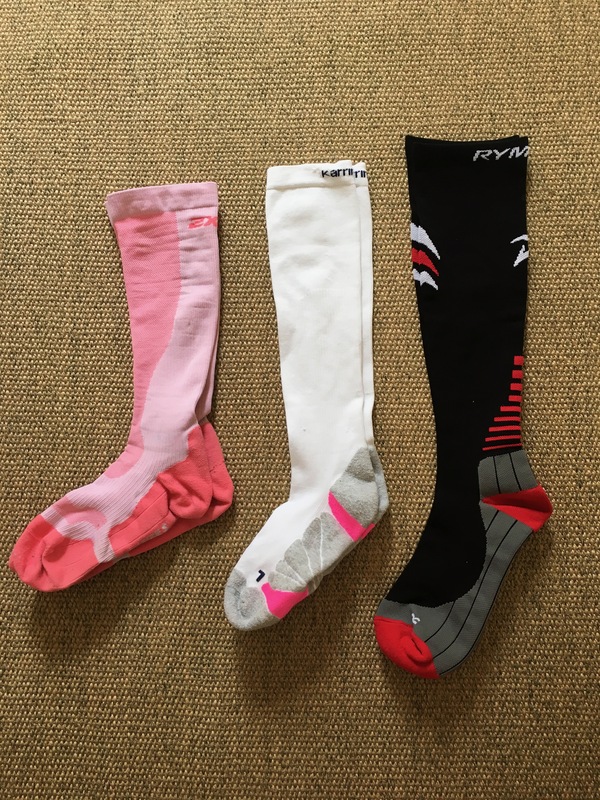 Do you wear compression socks/clothing? I’d love to know your thoughts on them!